Life’s many twists and turns often shape us in ways unexpected. For Wendy Klemperer, it was taking a sculpture class when all the painting classes were filled. And casually taking art classes while studying biochemistry at Harvard. Although she earned her biochemistry degree at Harvard, ultimately her love of art won out, and she went on to earn a degree in sculpture from the Pratt Institute in New York. Klemperer creates larger-than-life-size animals welded from twisted rebar scavenged from scrap yards and construction sites. Currently she has selections on display at the UNH Museum of Art at the Paul Creative Arts Center. 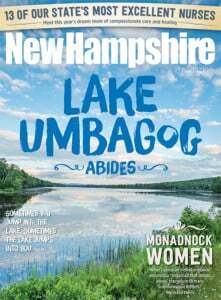 A Brooklyn resident who summers at her family homestead in Nelson, NH, where her love of nature and animals was fostered, she shows her work nationwide. That is exactly what she creates in her exhibit, “Restraint and Release,” where three chained hounds burst forth from the building’s brick façade baring teeth, lips curled back. Around the corner on the lawn, “Caribou” (Ihumataq) grazes — his preposterous antlers creating abstract branchy shapes. The sculptures capture the raw, untamed quality of the animals Klemperer depicts. The exhibition, “Restraint and Release,” at UNH’s Museum of Art will be in Mills Courtyard and in front of the Johnson Theater, Paul Creative Arts Center through May 2015.